One cannot help observing the strange bedfellows that appeared during yesterday’s appearance by U.S. Secretary of Education Arne Duncan before the House Education and the Workforce Committee. You had the committee’s chairman, John Kline, who has attempted to bolster his faux conservative credentials with talk of overly expansive federal education policy, declaring that he was “disappointed” in Duncan and the Obama administration for not increasing federal special ed funding. You had Democrats such as Ranking Minority Member George Miller praising Race to the Top and other competitive grant programs launched by the administration since it took office (even as Miller sparred with Kline over proposed reductions in spending increases from House Budget czar Paul Ryan). You had Duncan defending reductions in so-called Impact Aid subsidies, while Republicans chastised him for it. And you had Republicans defending the very formula-based school funding approaches they had long decried while a food number of Democrats (along with Duncan)making fairly conservative cases for moving towards genuine accountability in federal spending (albeit slowly, and definitely not when it comes to the president’s community college initiative). Certainly this reflects the nature of presidential election cycles, with the party holding the White House defending its record against congressional leaders acting as proxies for their party’s standardbearers. But when one then watches what is happening in the nation’s statehouses, one can easily understand why the battle over reforming American public education cannot be understood through the lens of traditional politics. Consider New Jersey, where a Republican governor and a Democrat-controlled state legislature have come together over the past two years to pass a series of reforms to the Garden State’s teacher compensation system. Or look at Connecticut, where the governor, Dan Malloy, is more in agreement with Republican counterparts in the legislature than the leadership among his fellow Democrats. Then there is Washington State, where a cadre of Republicans and Democrats are challenging the outgoing governor, Christine Gregoire, over allowing for the existence of charter schools; while home goods heir-turned-venture capitalist and longtime Democratic Party financier Nick Hanauer is flirting with backing Rob McKenna, the school reform-oriented Republican nominee presumptive, out of frustration with the intransigence of fellow Democrats on overhauling the Evergreen State’s school system. Meanwhile the toughest states for advancing reform are not the ones in which Democrats dominate, but in those states with majority-Republican voting bases. Earlier this week, legislators in Kansas, under pressure from school districts (and nativist fears) shot down an effort to launch a voucher-like tax credit initiative. In Alabama, the battle over allowing for the authorization of charter schools is as much shaped by the influence of the state’s districts (which wield considerable political influence in legislative districts) as the now-weakened National Education Association affiliate there; even with a Republican governor and legislative chieftains supporting the creation of charters, their fellow party members could end up voting the other way. And as seen earlier this month in Florida, when a Parent Trigger law went down to defeat, Republican legislators are willing to kowtow to NEA and American Federation of Teachers affiliates, and the so-called parent groups that aid and abet them. The reality is that in most cases, debates over reform have far less to do with political ideology than with the power relationships (and often complementary views on the potential of poor and minority children) that often exist at the state and even school district levels. Especially in Southern states outside of Texas (where districts are often county-based), and even in the Rust Belt, school districts are often the biggest employers in their communities and the most-powerful political players in communities. Plenty of state legislators, regardless of party affiliation, have gotten their start serving on the school board with support from the local teachers’ union affiliate; their relatives often also work for the district in some capacity. These relationships, along with the interest of politicians in keeping office, often lead to legislators being far less interested in embracing any sort of systemic reform. The fact that even suburban districts have become as dependent on federal special education and Title I dollars as urban district counterparts also plays a part in legislative and congressional considerations. 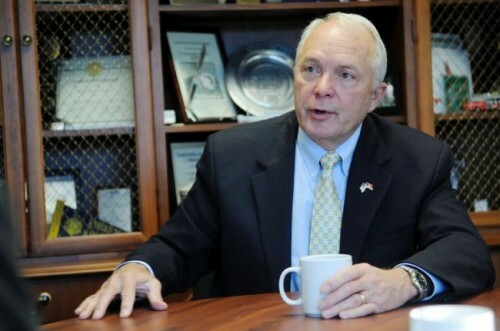 Consider the case of House Education and the Workforce Committee Chairman Kline. Among the school districts Kline represents from back home in Minnesota is South Washington County, where special ed students account for 11 percent of total enrollment, according to Dropout Nation‘s analysis of U.S. Department of Education civil rights data; 40 percent of students in the Carver-Scott Educational Cooperative (which serves nine districts) are labeled learning disabled. Such large numbers explain why Kline is so adamant about increasing funding for special education programs that do little for the children in their care. This shouldn’t be shocking. One of the reasons why old-school civil rights groups such as the National Association for the Advancement of Colored People fight so hard against charters and school choice is because veteran teachers and teachers’ union affiliate bosses (all beneficiaries of defined-benefit pensions and other aspects of traditional public education) make up the majority of their memberships; the fact that such groups are recipients of teachers’ union largesse also makes it difficult for them to break ties without risking their finances. Same is true for old-school parents-teachers groups and other outfits associated with education traditionalists. While there may be internal struggles over education policy positions, the fact that status quo defenders still hold control within these outfits means that they will provide little support for anything but the mildest of reform solutions. Such relationships also explain the alliance between the Obama administration and reform-minded Republican governors who have been as willing to embrace Common Core standards as their Democrat counterparts (and even more willing to support Race to the Top, the Investing in Innovation effort, and other competitive grant programs than either their own congressional counterparts or Obama’s Democrat allies in statehouses). One of the reasons why the action on reauthorization of the No Child Left Behind Act has stalled because Kline doesn’t have much support either from Republican governors (and just as likely, from House Speaker John Boehner) to move ahead with his piecemeal effort to scale back the federal role in education policy. It is also why complaints from otherwise thoughtful conservative school reformers that the Obama administration is forcing states to enact Common Core standards through efforts such as granting waivers from accountability provisions of the No Child Left Behind Act don’t actually stand up to scrutiny. If anything, reform-minded governors of both parties embrace a more-expansive federal role because it serves as a way to overcome opposition from education traditionalists who have, until recently, dominated legislatures on the school front. Enacting Common Core standards, for example, makes it easier to overhaul curricula standards that in most states hardly meet up to international scrutiny. It also reduces the number of battles that governors and chief state school officers must have over what should be (or shouldn’t be) in textbooks. As seen this month in Tennessee, where state education czar Kevin Huffman has to worry about legislators mandating what should be taught in science courses — and in states such as California, where discussions over history curriculum can break down over whether Cesar Chavez should be included in history textbooks — there are plenty of forces that can derail any effort if not for some (perceived) intervention from the federal level. But the alliances across the political aisle shouldn’t be surprising. One of the interesting aspects of the battle over the reform of American public education has been the lack of correlation between party affiliation and school reform positions. In Indiana, the latest round of reform efforts were spurred by the odd alliance between Stan Jones (an appointee of former Hoosier State governor and later U.S. Senator) Evan Bayh), former Indianapolis mayor Bart Peterson (a Bayh protégé), Derek Redelman (a Republican who ran the successful election campaign of Jones’ rival for state schools chief, Suellen Reed), and Kevin Brinegar (Redelman’s boss at the state chamber of commerce). In fact, Redelman ended up becoming a fierce foe of Reed, who opposed nearly every reform measure undertaken by the state. In California, it took a Republican governor in Arnold Schwarzenegger and a state Democratic power in Gloria Romero to enact the nation’s first Parent Trigger law and allow for student performance and teacher performance data to be tied together for improving teacher evaluations. In Texas and Florida, the reform efforts begun under Democrat governors were expanded upon by Republican successors, often teaming up with Democrats disaffected by the lack of will among their fellow-travelers to do the right thing by children. Chances are, such relationships will continue, this time between reform-oriented state school superintendents and civil rights groups. This was on display earlier this week at the Council on Chief State School Officer’s annual legislative confab, where a special breakout session between civil rights groups and state education leaders was held. Indiana Superintendent Tony Bennett (whose state has taken a slight backslide on accountability courtesy of the Obama administration’s No Child waiver gambit), demanded that civil rights groups hold accountable state education departments for enforcing their accountability provisions, and noted that one of the reasons why one Hoosier State accountability law, Public Law 221, was ineffective because no one forced state officials — including Bennett’s predecessor Reed — to seize control of failure mills and shut down dropout factories. Given that federal education policy — including Race to the Top and No Child — have signaled the reality that states, not school districts, control the direction of education, civil rights-driven school reform groups will have to become more-involved in state-level advocacy; and those groups are getting the message. This isn’t to say that traditional politics won’t get in the way. It is the anger among movement conservatives over the excesses of the George W. Bush presidency in other areas that as much explains the rhetoric of Kline and newly-elected Republican congressmen as the parochial concerns at home (as well as why Republican presidential candidates have all but avoided discussing education policy). Meanwhile the budding alliance between NEA and AFT affiliates and progressive elements within the Democratic Party could end up causing trouble for centrist Democrat reformers. Then there are the divides among conservative, libertarian, centrist and liberal Democrat reformers over everything from the abolition of teachers’ union collective bargaining privileges, to questions over whether addressing achievement gaps should be a focus of reform efforts. Particularly among centrist Democrats, they must always keep in mind that their own efforts to weaken teachers’ union influence are no different in substance than those of Republican governors such as Wisconsin’s Scott Walker, and thus, must walk a fine line on their rhetoric. But school reformers will continue to find themselves working across political and ideological lines. Because, as legendary Prohibition activist Wayne Wheeler would say, reformers have to work with everyone who will support them. And because they increasingly find that their own politically ideological fellow-travelers don’t share the same views on helping all children succeed in school and life.